It felt unreal. I have no idea, and no one else has any idea, where my barely-4-year-old is. He’s just loose in the world. Maybe striking out West? Getting married? Who can say? Because I don’t know where he is or what he’s doing. What happened was… We took the boys to my hometown theme park, King’s Island. Damon and cousin Colleen took off to hit those rides that make me anxious just to watch. 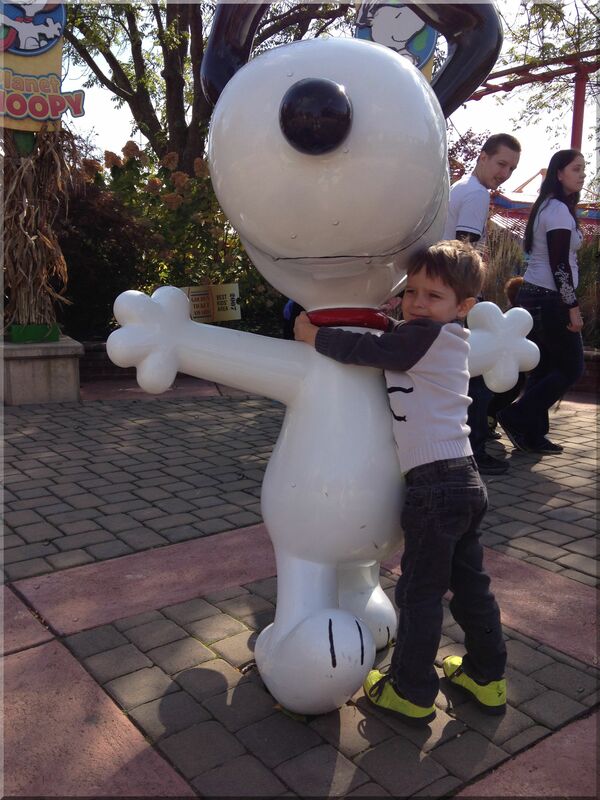 I took off with the boys for Snoopy Land, which is more their speed and mine. I hit a frustration wall with their relative paces — I have one lagger (Alden moves at about 1 agonizing mph) and one dasher (Elliot’s stuck in fifth gear. Is fifth a gear?) and finally decided to put them both under stroller arrest. I parked them in a cafe and, as I shifted purses and jackets off the stroller, Elliot turned and walked out. At least I assume that’s what happened. I looked up and he was gone. 1. Aggravation. This is the first two or three minutes, where I’m still assuming that Elliot is under a table, behind a plant or otherwise within reach and I will find him momentarily. Along with being a runner, he is a hider, so this isn’t unfamiliar territory. 2. Dawning Anxiety. He really doesn’t seem to be in the cafe. This is when I parked Alden with my mom and another cousin, and started jogging up and down the walkways near the cafe. Surely. SURELY he is nearby. Nope. 3. Houston, we have a problem. This is when I acknowledge to myself that he is lost. I call Damon and get voice mail. He’s probably strapped into some crazy ride and likely can’t hear his phone ringing. I leave him a 10-second rundown and tell myself that by the time he calls back I will be able to answer with, “I’ve got him.” I start to increase the range of my search while trying to make sure I’m not missing a possibility right under my nose. It’s not like the pathways are linear, so I’m frustratingly aware that at any moment he could be within sight — behind me. 4. Time to Get Serious. Roughly 10 minutes have gone by. This was the part where I have to make the decision to stop looking. I need to go get help. I know that he could be moving farther away or getting into more trouble with each minute that passes. One person searching for him is not enough. I go find a park employee and ask where the lost children office is. What I’m doing now is a little faster than a jog as I head over to file a report. When I start laying out the story I’m waiting for the woman behind the desk to tell me that this happens all the time. She doesn’t. She’s a nice woman who seems to be filling in. She hunts and pecks on the keyboard and has to check several times to make sure she’s “doing this right.” I do not grab her by the lapels and shake her. A note on kidnappers: Of the various concerns pinging on my radar, this one hardly registered. Statistically, it’s just so unlikely. Even at my most concerned, I was well aware that Elli was in more danger on the highway to the theme park than he was at risk of some nut case grabbing him. What I was getting more concerned about by the minutes is that he would find his way into a dangerous area and be exposed to something like a ride mechanism or power sources. I’d already hauled his heinie out once as he tried to shimmy under a fence that very day. I was also mentally reviewing all the parts of the park I’d seen for fountains, lakes and ponds. I also hoped that he wasn’t too scared, wherever he was. But I also kind of hoped he was very scared, scared enough to remember next time he thought about heading out. Jillian: Stop. Elliot is missing. I need your help. Come back. Damon: What?? I can’t hear you! Did you say something about Elliot? Jillian: He’s missing. Come back. I wrap up with the woman and she says, “Okay, the security guys are on their way. You can wait right here for them and…” I’m getting into the groove of interrupting people. I say, “You have my cell number. I’m going to look some more. Your security guys can call me when they get here.” We’re at about 15 minutes. 6. The Most Likely Thing Happens. I start to circle around the park again, each loop a little bigger than the last. I push back firmly on terribly thoughts like, “What if you have to leave here tonight without him?” And then. There he is. Walking down a pathway with a park worker carrying a broom and dustpan. I can see that they’re chatting. Elliot looks totally unconcerned. As I pull up next to them, Elliot looks over and says, “Mommy, I was looking all over for you.” He’s peevish. The guy (I’m sorry I didn’t get your name, nice guy!) tells me he saw Elli loitering outside a pretzel stand (which I’d checked, because he HAD been asking for a pretzel) and was bringing him over to the lost kid office. 7 Denouement. I called around that all is well. We all took several deep breaths. The lady called my to tell me the security guys had arrived and I was able to answer, “I’ve got him.” We bought a round of ice cream cones. Then we went back to riding rides, because that seemed like a better choice than letting this ruin our day. What I learned from this: Whenever I take Elliot out in a crowd I write my cell number on his arm with a Sharpie. Since it’s winter, I also write “Call my mom” on the back of his hand with an arrow pointing under his sleeve. It is my fervent hope that by spring he will be slightly less inclined towards these shenanigans. What Elliot learned from this: Not one damn thing. He wasn’t upset and I have no doubt he will hare off again at the first opportunity. Wow, quite a roller coaster. Glad that scary ride was only 20 minutes. That was definitely the scariest ride of the day! I can imagine the fear, the anger, the anxiety…all of it. Just so scary….Your solution is brilliant. I Sharpied him at the zoo a few days later and he was INDIGNANT. Yes, all those stages. Except that I worry about kidnappers a lot. What a scary feeling! Totally! I think I just don’t have room for that in my head because I’m so worried about mundane dangers like drowning.